The historic first Australian women's team was established in 1978 to take part in the first World Women's Invitational Tournament in Chinese Taipei. Australia was the only national team in the tournament with the other twelve countries represented by club or district teams. Australia's squad for the 1978 tournament, selected by first Australian women's team coach Jim Selby, consisted of players mainly from NSW and Western Australia. Captain Connie Byrnes had the honour of captaining the first Australian senior national women’s team. In the first round of matches Australia was missed sixth place only on goal difference. The Australians then competed in the second round for teams placed seventh to thirteenth, ultimately finishing eighth in the tournament. Australia's results of the 1978 World Women's Invitational Tournament in Chinese Taipei: W1-0 v Austria, D1-1 v USA, L0-1 v Sweden, D0-0 v Denmark and W5-0 v Thailand. Young Australian Anna Senjuschenko (who tragically died in a car accident in 1979 aged 17) was voted a star player of the tournament by the media, while Connie Byrnes was awarded ‘Miss Football’ for Australia. The women’s team played on sporadic occasions throughout the 1980s, with only a limited number of major international competitions enticing much attention to the team. 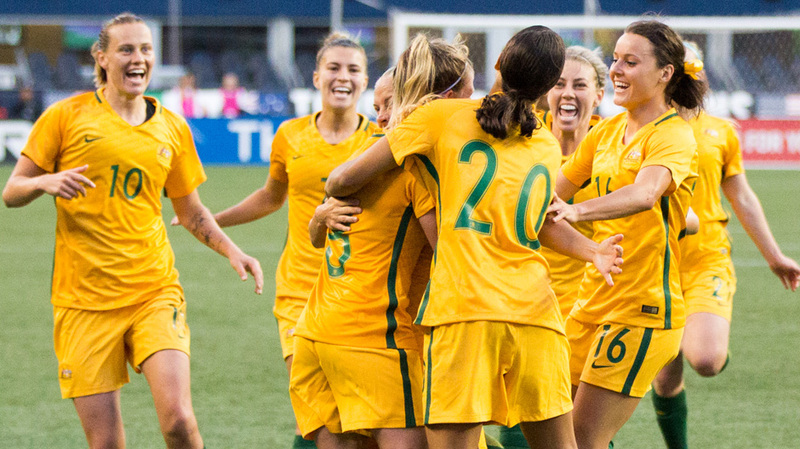 The introduction of the FIFA Women’s World Cup and women’s football at the Olympic Games in the 1990s, combined with a surge in participation levels throughout the country, sparked renewed interest in the national women’s team, now called the Westfield Matildas. After barely being beaten out of a place at the inaugural FIFA Women’s World Cup in China in 1991 on goal difference (by New Zealand in the Oceania qualifiers), the Australian women’s national team has never failed to qualify for the World Cup, finishing as top team in Oceania in the 1995, 1999 and 2003 Oceania World Cup qualifiers. The Westfield Matildas qualified for the 2007 finals via Asia for the first time, after reaching the final of the 2006 AFC Asian Women’s Championship in Adelaide. Australia qualified for the following year’s World Cup after defeating Japan in the semi-final 2-0 (top three nations in the tournament qualified for the World Cup); the final however saw the Westfield Matildas go down to China only after a penalty shoot-out, to finish runners-up in the tournament. The Aussies went that one better in a memorable 2010 AFC Asian Women’s Cup in China, defeating the highly-fancied Korea DPR side on penalties in the final following a 1-1 scoreline after 120 minutes of play and earning the country another shot at the World Cup. Australia appeared to gradually learn and improve throughout each of its first few World Cup forays, as the aggregate goal differences over each World Cup shows: a goals for-and-against record of 3-13 (minus 10) in its 1995 World Cup matches reduced to minus 4 in 1999, and went down to minus 2 in the 2003 campaign. By the 2007 tournament, a positive goal difference over the four matches, which included Australia’s first World Cup finals win (4-1 over Ghana) and quarter-final appearance (a 2-3 loss to Brazil) displayed how far the Aussie women’s team had come over the previous 12 years. Further testament to the team was provided when coach Tom Sermanni was named 2007 AFC Coach of the Year. In 2011 Australia put in arguably their best FIFA Women’s World Cup performance to date with a strong showing in Group D where the team came out of the group with six points following wins against Equatorial Guinea and Norway as well as a narrow 1-nil loss to Brazil. In a tournament where Australia had the third youngest team, with an average age of 22, the team performed strongly and received many plaudits for their style of play and character. Australia were knocked out in the quarter final by eventual third placed Sweden, losing 3-1 to the world’s fifth ranked nation. Women’s football was introduced to the Olympic Games for the 1996 tournament, where only the top eight teams of the 1995 World Cup qualified (Australia had finished 12th in the 1995 World Cup). The Australian women’s team qualified for the Olympic Games finals tournaments in 2000 (as host nation), and again in 2004 as winner of the Oceania qualifying tournament, where just Papua New Guinea and Fiji stood in the way of direct qualification. With Australia’s entry into the Asian Football Confederation (AFC) in 2006, qualification for the Olympic Games was made much more challenging, especially for the 2008 Games where hosts and AFC member China were credited with an automatic spot. This meant just two more Olympic Games spots were available for the entire continent, Australia finishing second behind winners DPR (North) Korea who gained the qualification spot from Group B. Australia will attempt to qualify for the 2012 Olympics later in 2011, when the top three nations in the AFC qualification tournament progress to London 2012. Similar to the improvement shown over its first few World Cups, the Australian women’s team commenced its Olympic Games experience modestly, losing two and drawing one at Sydney 2000, before improving markedly in the 2004 tournament, where a 1-0 win over host nation Greece and a 1-1 draw with powerhouses USA enabled the Aussies to reach the quarter-finals stage for the first time in a major women's international tournament.